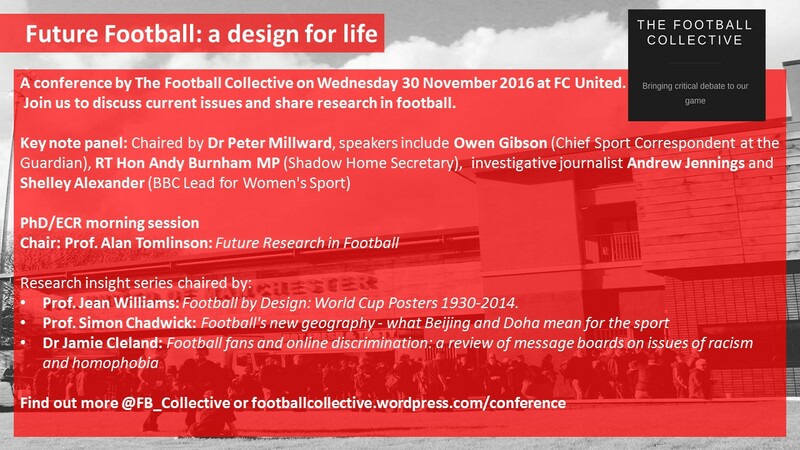 We are delighted to announce that Dr Jamie Cleland will chair and present as part of the Research Insight Series for one of 3 afternoon sets of presentations at our forthcoming conference on the Wednesday 30 November 2016 at FC United. Jamie is a senior lecturer in the social science department at Loughborough University, UK. He is the author of A Sociology of Football in a Global Context (Routledge, 2015) and co-author of Football’s Dark Side: Corruption, Homophobia, Violence and Racism in the Beautiful Game (Palgrave, 2014) and has published widely on contemporary football fandom and identity, particularly focusing on communication, sexuality, race and active supporter mobilizations in a range of international journals. Twitter: @drjamiecleland.